Dust generously with cocoa powder and top with a chocolate covered coffee bean just before serving! CUPCAKES: Preheat oven to 325 degrees. Line standard muffin tins with paper liners. Sift together cake flour, baking powder, and salt. Heat milk and vanilla-bean pod and seeds in a small saucepan over medium heat just until bubbles appear around the edge. Remove from heat. Whisk in butter until melted, and let stand 15 minutes. Strain milk mixture through a fine sieve into a bowl, and discard vanilla-bean pod. With an electric mixer on medium speed, whisk together whole eggs, yolks, and sugar. Set mixing bowl over a pan of simmering water, and whisk by hand until sugar is dissolved and mixture is warm, about 6 minutes. Remove bowl from heat. With an electric mixer on high speed, whisk until mixture is fluffy, pale yellow, and thick enough to hold a ribbon on the surface for several seconds when whisk is lifted. Bake, rotating tins halfway through, until centers are completely set and edges are light golden brown, about 20 minutes. Transfer tins to wire racks to cool completely before removing cupcakes. 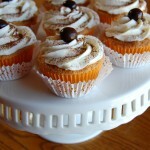 To finish, brush tops of cupcakes evenly with coffee marsala syrup; repeat until all syrup has been used. Allow cupcakes to absorb liquid 30 minutes. 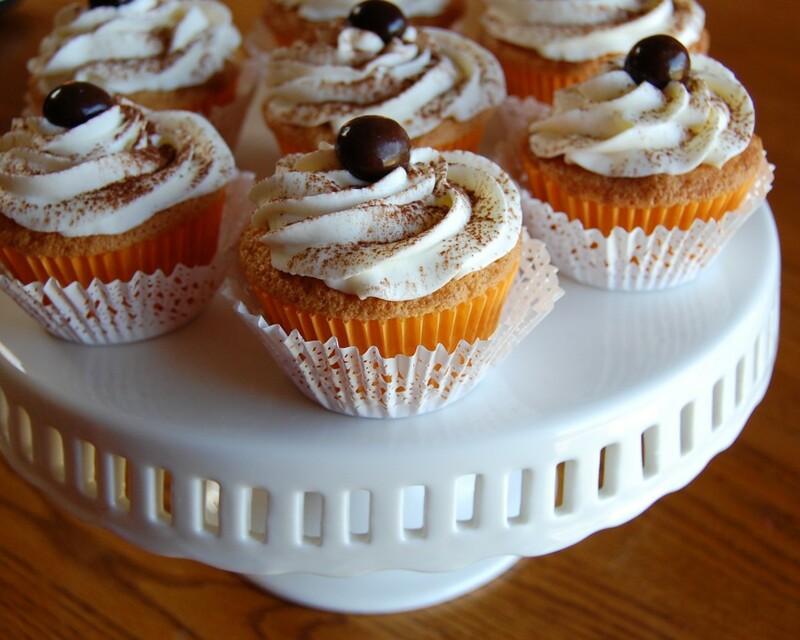 Dollop or pipe frosting onto cupcakes, refrigerate up to overnight in airtight containers. Dust generously with cocoa powder and top with a chocolate covered coffee bean just before serving. COFFEE MARSALA SYRUP: Stir together coffee, marsala, and sugar until sugar is dissolved. Let cool.